I've been so crazy about drying mushrooms lately. In different (Japanese) publications, I'd read about home-dry mushrooms. But, it wasn't until I watched a Japanese science TV show recently that I decided to make my own dried mushrooms. 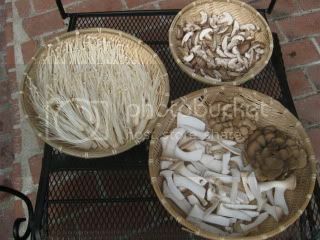 The show was introducing how much the flavor and texture will improve by drying mushrooms under the sun. The process is very easy. 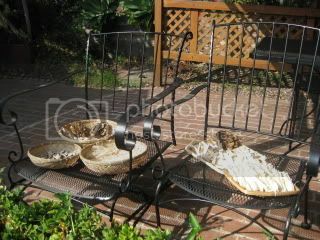 You put mushrooms in baskets and leave them under the sun for 1-3 days. After one day, mushrooms will be only slightly dried. 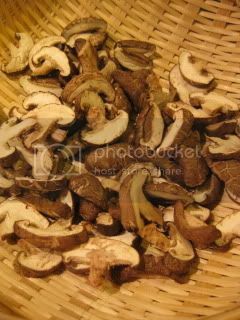 After two days, you can make nice "semi-dry" mushrooms (my favorite stage). Three-day process will make them even dryer. 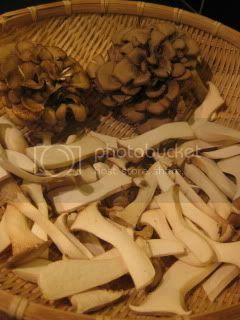 I did Enoki (cut off the bottom and separate into small bunches by hand), shiitake (sliced), eryingi (sliced), and maitake (cut off the bottom). During the process, I simply turn them over sometimes to make sure the even result. 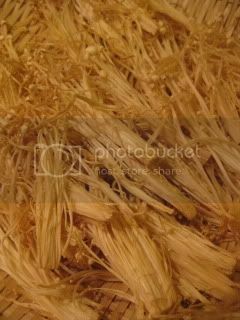 By sun-drying mushrooms for a couple of days, the umami level will multiply...for enoki, the umami flavor will be 13 times as much compared to fresh enoki. My two-day sun-dried mushrooms. 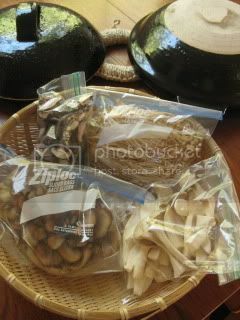 You can put them in tight-sealed bags and keep in the refrigerator for a week or so. When you want to use them, just rinse them lightly before cooking. I've been making sun-dried mushrooms almost every day lately...I'm so crazy about it! The flavors turn so deep and so amazing. I've been making a lot of hot pot donabe dishes with my sun-dried mushrooms. They are incredible. I'm serious.